Real-time analytics is the cornerstone of a sustainable advantage for today’s enterprises. Faster insights and their resulting actions increasingly make the difference between success and failure for many businesses. 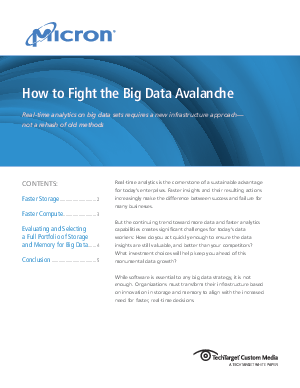 But the continuing trend toward more data and faster analytics capabilities creates significant challenges for today’s data workers: How do you act quickly enough to ensure the data insights are still valuable, and better than your competitors? What investment choices will help keep you ahead of this monumental data growth? Download this white paper to learn how.